or a mixture of them. Each photoelectron is pulled by an electric field towards a dynode and subsequently amplified. In a 10 stage PMT, the net amplification is of the order of 5 . 10(5). Each scintillation pulse produces a charge pulse at the anode of the PMT. Besides in the above described pulse mode, PMTs can also be operated in current mode in which case the anode current is a measure for the radiation intensity absorbed in the scintillator. This can only be done when the photocathode is at negative potential. This allows to operate a scintillation detector is high radiation fields. The disadvantage is that all spectroscopic information is lost. The energy resolution, coincident resolving time and stability of a scintillation detector depend to a great extent upon the type of photomultiplier tube. The selection of a proper type is fundamental to a good detector design. The light conversion efficiency of a photomultiplier cathode is a function of the wavelength; the Quantum Efficiency (Q.E.) is defined as the chance that one photon produces one photoelectron. In the amplification process, one photoelectron produces per dynode step about 3 4 secondary electrons. With a 12 stage PMT, a typical gain in the order of 106 can be obtained. Fig.1 below shows a schematic of a PMT. It should be noted that PMTs are sensitive to magnetic fields; a μmetal shield provides adequate protection from the earth magnetic field. For operation in high magnetic fields, special PMTs are available. Gain, stability and dark current depend on the used dynode materials and are a function of temperature. Pulse rise time depends on the dynode structure. For fast timing applications, so called “linear focused” PMTs are advised. A very important factor is the sensitivity as a function of the position on the PMT entrance window. A large variation can cause a degradation of the energy resolution of a scintillation detector. This variation can be caused by a change in quantum efficiency of the photocathode or a non-uniform photoelectron collection efficiency from the cathode onto the first dynode. The above effects can be important for both small and large diameter PMTs. From the scintillation properties table is clear that each type of scintillator has a different emission spectrum. 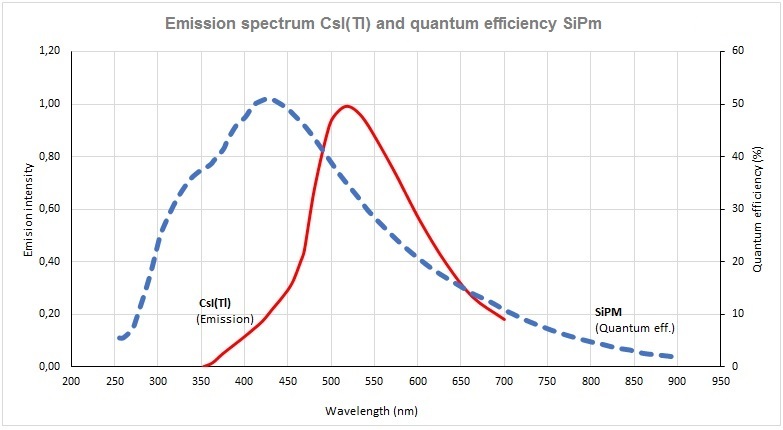 It is important for a good performance that the emission spectrum of a scintillator is well matched to the quantum efficiency curve (for definition see above) of the PMT. To detect the fast scintillation component of BaF2 for example, it is necessary to use a PMT with quartz window since glass absorbs all light below 280 nm. 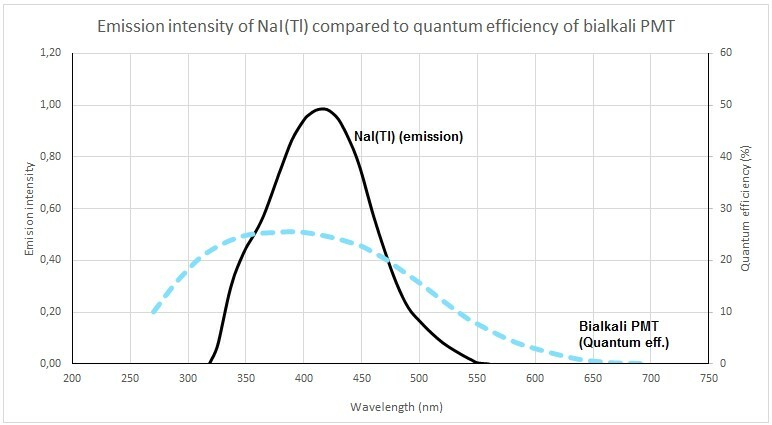 The figure below shows the quantum efficiency (Q.E.) 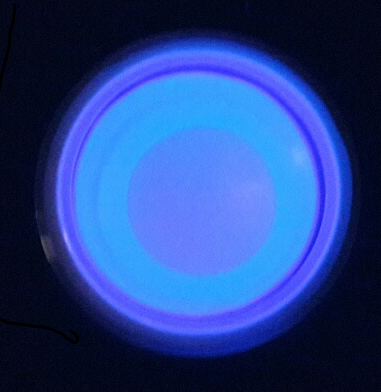 of a standard PMT with a bi-alkali photocathode. The emission spectrum of the most common scintillator NaI(Tl) is shown too. It can be seen that the overlap is very good. For other scintillation materials such as BGO, the match is less ideal. together with the scintillation emission spectrum of NaI(Tl). The gain of a PMT is temperature sensitive. The variation in gain, which depends on the photocathode and dynode material, amounts to typically 0.2 – 0.3 % per oC. Due to their dynode stages, PMTs are usually quite bulky devices although some short versions and miniature types have been developed. Care must be taken when PMTs are used inside magnetic fields. Although there are PMT types that have a high magnetic field immunity, this effect remains a problem. The material of a PMT is usually glass. 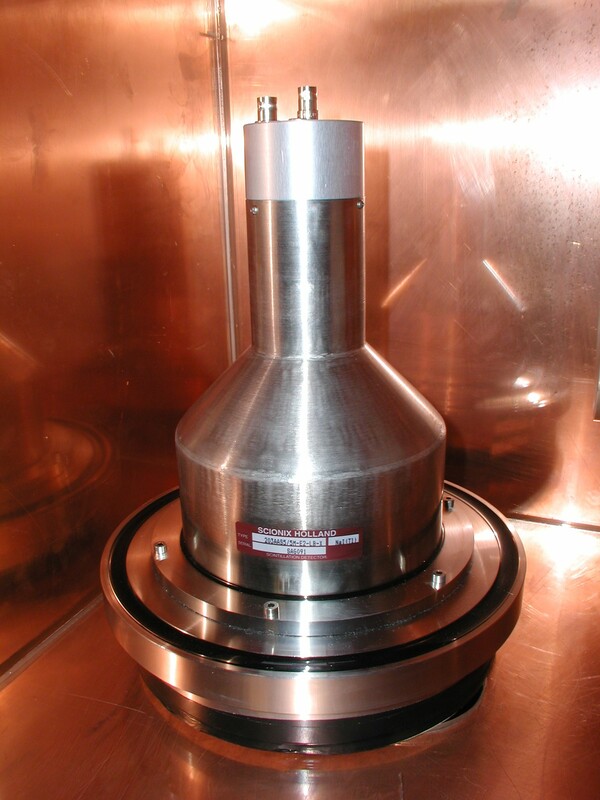 Glass has an intrinsic amount of 40K which contributes to the radiological background of the scintillation detector. 40K emits as well 1460 keV gamma rays as β-particles. The face-plate of the PMT can be constructed of special low-K glass. Furthermore, this background can be limited by using light guides absorbing the β-particles and creating a distance between the crystal and the PMT. The above techniques are used in so-called “low background” scintillation detectors. On this webpage we would like to summarize the advantages and disadvantages of PMTs in conjunction with scintillation Crystals. Please see the Tabs on the top of the webpage. For more information regarding PMTs we refer to the PMT manufacturer’s literature. Below we would like to summarize the advantages and disadvantages of PMTs in conjunction with scintillation crystals : For more information regarding PMTs we refer to the PMT manufacturer’s literature. at respectively the anode and the cathode of the diode. Most frequently, reverse biased PIN photodiodes are used having a low capacitance and low leakage current. When photodiodes are optically coupled to a scintillation crystal, each scintillation light pulse will generate a small charge pulse in the diode which can be measured with a charge sensitive preamplifier. Alternatively, the current produced in the diode can be measured. The quantum efficiency of silicon photodiodes is typically 70% between 500 and 900 nm but decreases rapidly below 500 nm as shown in the figure below. It is clear that the highest signals can be expected from scintillation crystals that have an intense emission above 500 nm. CsI(Tl), characterized by a large scintillation intensity with a maximum at 550 nm, are therefore well suited to couple to photodiodes. 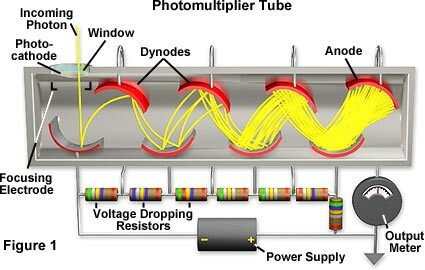 In contrary to photomultiplier tubes, photodiodes do not require a high voltage (HV) power supply but only a bias voltage of about 30 V. Photodiodes are thin, rugged and insensitive to magnetic fields. 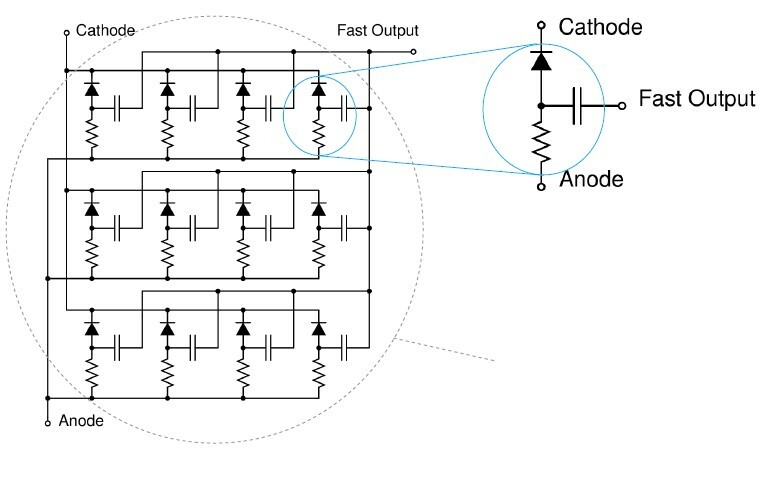 Furthermore, the output signal from a crystal/photodiode detector is very stable due to the absence of drift of the diode gain since no charge amplification takes place in the device itself. Photodiodes are thin (several mm) which can be advantageous. together with the emission spectrum of CsI(Tl). Due to the small signal generated by the photodiode, it is necessary to employ a high quality charge preamplifier in order to keep the noise level as low as possible. Noise is an intrinsic problem to standard photodiodes. In silicon PIN photodiodes, the created number of primary electronhole pairs (eh pairs) is not increased by amplification. The PIN photodiode is a unity gain device. 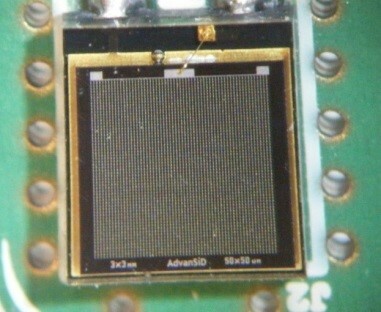 The thickness of the silicon used is typically 200 500 μm. 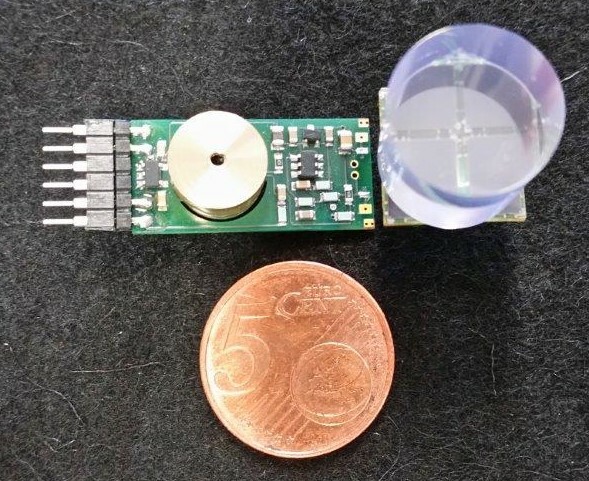 Coupled to a conventional (low noise) charge sensitive preamplifier, the substantial capacitance of the device (40 50 pF/cm2 for 200 and 300 μm wafer devices) is mainly responsible for the noise which determines for a large part the energy resolution of the detector. Also the dark current of PIN photodiodes (1 3 nA/cm2 at full depletion) may contribute significantly to the noise, especially at larger shaping times. The dark current increases as well with increasing surface area as with increasing temperature. As long as there is enough light per event available, every scintillation event can be detected using photodiodes. However, due to the intrinsic noise there is a lower limit on the energy of the radiation that can be detected. For a small (1 cm3) CsI(Tl) cube coupled to a 10 x 10 mm2 photodiode the best lower energy limit reported amounts to approx. 40 keV. 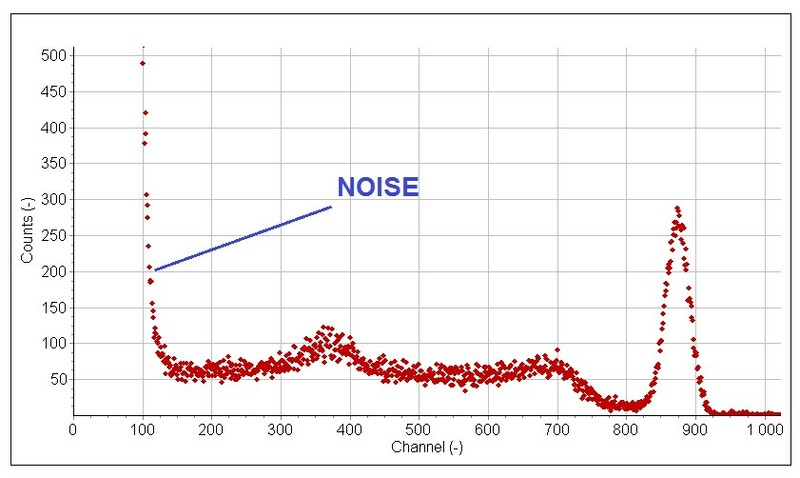 From the above noise numbers and the electronhole pair yield of the scintillator / photodiode combination, the noise contribution to the energy resolution can be calculated. 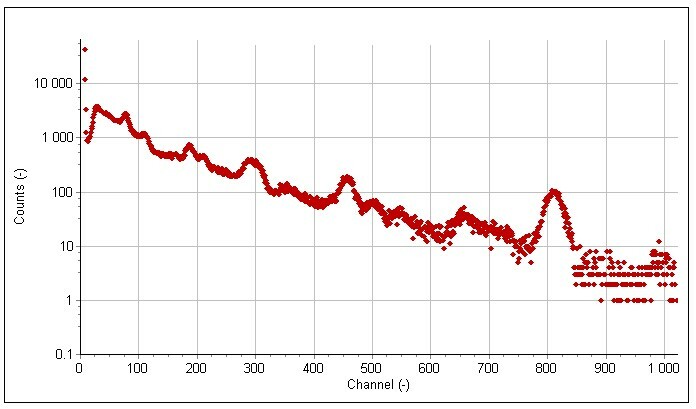 The figure below shows a pulse height spectrum measured with a photodiode scintillation detector. At increasing temperatures, the dark current of the photodiode increases. This limits the use of scintillation photodiode detectors to temperatures below 50 C.
Photodiodes can also be used in DC mode to read out a scintillation crystal. Capacitance and leakage current are less important then since the diode is used unbiased. This mode of operation is used for applications where radiation intensities are high and close packing of arrays is scintillation crystals is required such as in medical CT scanners. The low level noise limit can be overcome by using so called “Avalanche Photodiodes“, APDs. In these devices an internal amplification enables to detect also X-rays of lower energy. However, an external voltage of at least several hundred Volts is required and the amplification is a strong function of temperature (gain stability). Also the leakage current of APDs at room temperature is relatively high. APDs are currently available in approx. 1 cm diameter size maximum. APD signals are much faster than signals from PIN diodes (ns range) and are mostly used for fast timing with small scintillation crystals or when operation in a magnetic field is mandatory. All diodes are susceptible to radiation damage induced by particles or gamma-rays which usually results in an increase in the dark current. 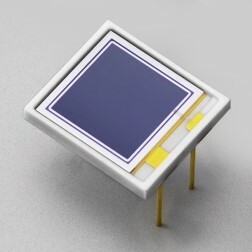 Silicon photomultipliers are arrays of micron size self-quenched avalanche photodiode pixels operating in Geiger mode just above the breakdown voltage. When a photon is absorbed in a pixel it fires a defined charge. More pixels firing simultaneously implies a larger total charge pulse. SiPm elements can be combined into matrices. 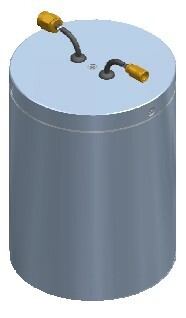 SiPms can be operated up to 60°C. For applications where small size and low voltage operations are required, SiPm readout of scintillators can be a good choice. SiPms behave totally different from classical photomultiplier tubes, as well with respect to signal processing as to spectroscopic behavior. The gain of SiPms is a very strong function of the bias voltage which should be chosen carefully depending on the actual application of the detector. The number of SiPms needed on a scintillation crystal depends on the requirements. SCIONIX has developed a range of sensors equipped with SiPms for a great variety of applications. SCIONIX has developed bias generator / preamplifier modules for SiPm scintillation detectors. The gain drift as a function of temperature is internally corrected. Such modules operate at voltage 5.2 – 16V and consume less than 30 mW. It is also possible to read out scintillators using CCD cameras when the intensities are large and when imaging is an objective. Usually energy information is lost in this cases.